I am guilty of moving far from my work. It is a 16.6 mile commute but I do it on a road bike round trip 5 days a week. It takes me around the same time as driving bc traffic here is pretty bad (Oahu, Hawaii). 32 miles roundtrip is a great workout and I feel in the best shape I have ever been in. MMM, It’s all your fault. I tried riding my bike but it was a smaller than average sized bike with small wheels which took a ton of effort and it still took me 30 minutes to get to work. I decided to upgrade to a cross bike and with all the traffic, stop lights, hills, pedestrians, and bumps, I can get there in 20 minutes. So now, if I’m running late for work, I no longer have an excuse to just “hop on the train” because it will always be faster to get to work on my bike even though taking the train seems like I’m making more of an effort to get to work on time. What is it with that psychology?! “If I take my car or train it will surely be faster” even when it’s not? What I would LOVE for you to write about, though I am not sure you have any experience, is advice for people who live abroad who want to have an online brokerage. All my income is in yen, Japanese banks have 0 interest, and it’s hard to find a brokerage where I can wire money and convert it to dollars where it wouldnt entirely eat up the costs. Maybe an article about off shore accounts like in Singapore where you can keep your money in your currency but still invest in other markets? No “sorry i am late, but traffic was terrible”, or “the train was delayed”…. When I started working, I decided that i wanted to always live withing walking/biking distance from work. Pretty much achieved that. For three years, at two different job, i was working about a 30 min drive from home. But since i had a place in the city, it was always a reverse commute. I hear you MMM, I never wanted to be a slave to the automobile, and worse, to traffic. You have to sacrifice living in the city (space, higher real estate), but then again, your property retains value, especially in a recession. Now, it takes me 20 min on bike to get home. Maybe 25 if I take a nice leisurely detour to see something different. I wonder if the future will bring some sanity to the commuting thing. I understand there are privacy issues around what your smart phone knows about you, but if you looked at the data of each person commuting, I bet you could find some patterns which would help. For example: Mr. X is a pipe-fitter who lives in city A but commutes to city B, and Mr. Y is also a pipe-fitter. He works in B, but commutes to A. Why can’t the guy in A work in A and the guy living in B work in B? It is a problem of not having that data exposed. Seems like there are a lot of jobs which could be re-jiggered if you knew about it. School teachers? Nurses? Programmers? I know people are not all the same, but they are not all that different either… just a thought experiment. What an interesting idea! Instead if calling up places in your town for work and finding out that they don’t have any openings, you could just ask if they have someone in your role who lives in the town over where you currently work and find out if they’d be willing to swap locations. I live 2.5 miles from work and use a 14-yr old car for the commute. Living close to work as all kind of advantages. I routinely come home to have lunch and talk with my wife before she leaves for the afternoon shift. That’s quality time that you simply don’t have with a long commute. When my kids grow up to be in any of these schools, you can bet your house I will be having lunch with them and my wife at least 2-3 times a week and they will not be eating school lunch c**p.
Nice! Now you might want to look into a bike (or at least a motor scooter) if you really want to bring the pleasant nature of your commute to the next level. And let’s not forget the hundreds of thousands of dollars in future medical costs that come when one is older from having sat in a car all day instead of riding or biking or walking to the bus. Not walking = diabetes type 2 for many folks. What about time? A 25 minute commute one way translates to 50 minutes a day (there and back), 250 minutes a week, 12,500 minutes a year ~ 8 1/2 days! Basically even though it’s a modest commute it’s about 4 weekends a year spent in the car. Granted, it’s not all at once. But it is time that could be spent exercising on a shorter commute by bicycle or on foot, watching TV, reading, self improvement projects, or anything else. Even if it was 25 minutes on a bus or subway you could still read, do work research/study, or listen to music or podcasts. But in a car it’s 4 weekends of unproductive road rage PLUS aforementioned expenses. Relatively new reader. Love love love your blog and your philosophy. My husband and I figured out this concept of living close to work a while ago and paid more for a rental nice and close to both our jobs. It was about 1/2 mile to mine and 1 mile to his. This is all in a highly desirable walkable community, close to restaurants, library, bars, subway, running trails, parks, etc. We sold our 1 yr old car at Carmax and kept the couple year old Honda fit, then biked or walked to work. Life was so good, and we new it. Daycare is also within easy walking distance (less than 1/2 mile). When we had one we would bike him in the trailer, but now that we have 3 that doesn’t really work. We still walk them in the stroller whenever possible, though. Now the Army is sending me to a new job, which is 31 miles away from our current home. Husband’s office has moved just a bit, now 1.5 miles to his work. He still bikes almost every day. Really dreading my soon-to-start soul-sucking commute. I HATE driving. I have a great road bike (was a decent age-group triathlete before kids) and would love to bike but it just seems to far and would just mean lots more time away from the family. Public transportation is an option (subway + bus) and would be subsidized by Uncle Sam, but would take at least twice as long as driving. So we’re talking still more time away from family and not sure I’d make it back before daycare closes. The way I see it my only option to not commuting is to move close to my work, thereby transferring the soul-sucking to my husband, or moving close to my work and he stops working or finds a job closer to mine. He likes his job and makes about 3 times what I do…so he’s not thrilled about that option, but is open to it as we pursue a more Mustachian existence and learn we really don’t need so much to be a happy family. Looking for encouragement or ideas/solutions I’ve missed? Thanks! I don’t think your situation is unusual; it seems to be fairly common for dual-income households to end up strung between two faraway jobs, forcing a long commute. I know a couple who each commute 50 miles to work — in opposite directions. – You could move someplace that has better public transportation to your job, maybe something with a one-seat ride (without knowing anything more, this seems like it might be the best option). – Regarding public transportation, consider also that the time you spend driving is wasted, while the time you spend on the bus or train is time you can use to read, e-mail, listen, sleep, work, etc. – You could move midway between your jobs, putting you each about 16 miles away. That’s at the limit of bicycling, but feasible. – If there is someone in your neighborhood you could carpool with, it might cut the pain of car commuting. Or if they can drive you every day, you might avoid buying a car altogether. Or you could move near someone who commutes to your job specifically so as to carpool. – If your spouse makes more than 3X than you, and you have to pay for daycare, you may want to consider how committed you are to your career. Are you actually making money after paying daycare, an extra car, and taxes? Where we live now is nice and close to the subway (1/3 mile). The problem is on the other end I have to take a bus because no subway goes to the Army base I am being re-assigned to. Moving somewhere with a one-seat ride, i.e. on a bus line that goes to the base would just result in my husband having a long commute, too. Sadly, I’m one of those people who can’t read in a moving vehicle or train. And even when not reading, I still end up feeling rather nauseated at the end of a lengthly bus or subway trip. 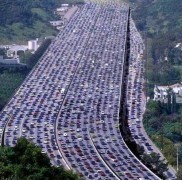 Carpooling is an idea. I have one possible lead and will look into some others. The main problem with carpooling is then you are tied to the same schedule. Since I’m not a shift worker, sometimes problems arise that requiring me to stay later. Similarly, sometimes the work is done early and I can leave early, but not if I’m part of a carpool. I think in the end, short of my husband quitting or changing jobs, I’m going to try to come up with some hybrid. I.e. carpool one day, bike one morning, public transportation back home that afternoon, drive the other days, etc. Probably mostly I will drive, because when it’s all said and done that’s the fastest way to travel those 31 miles and will result in the most time with my kids. But I’m not happy about it. And blog entries like this reinforce how much I hate commuting and how stupid I think it is! We had tried to avoid it, and were successful for about 4 years, but that has now come to an end. MMM, you won (or lost) the genetic lottery when it comes to sweating. When I bike at even a moderate pace, I sweat. Heck, waiting at a traffic light, I’ll sweat, even if it’s only in the 70s. It doesn’t help that my area is hilly. So no biking in a suit for me. Luckily my workplace dress is business casual, khaki pants and a button down shirt. When I bike to work, I bring my work clothes in a bag, along with a towel and deodorant, and I’m good. I wish I had the no sweat gene though, it would make bike commuting easier. You could redo those mileage figures because the $.51 a mile is paid with take home pay. Calculate how much an hour or a year that makes. Another reason given to justify a long commute is safety. Driving is a very risky behavior and is the prime factor in the high death rates of truck and delivery drivers or peolple who do route sales. FYI, I drove a car that cost me $4000 in 2003. It was 8 years old and had under 40000 miles on the clock. You find 35 mpg good? My car averages at 70 mpg because it’s very small, although I can get plenty in (e.g. 4 people + 2 big dogs, or I moved house with it twice…) and regularly drive 750 miles to the coast fully laden. I drove it for 10 years and another 75000 miles and was able to sell it for parts (it still worked fine and was roadworthy, but beginning to go and I wanted to anticipate repairs). Insurance cost me $500 each year, road tax cost me $190 pa (we pay according to size of engine). As we have summer/winter tyres for the seasons, a set of tyres cost me $280 every couple of years – again, some of the smallest and cheapest, even for quality. Let’s see, petrol costs somewhere between 1.70-1.90/l (CHF are not dissimilar to CAN$ or US$), depending on politics… Personally, I think this is really good value for money and the comparison to other cars is very interesting! Of course, we are in Europe (though strictly speaking, Switzerland does not politically belong to Europe!!) and don’t commute like the US. Oh, and I replaced that car last year with an identical deal – 7 yrs old, so slightly newer model (it’s a Renault Twingo, old model, a kind of modern-day Citroën 2CV wonderbeastie :)). My employees commute too far. I can’t stand this and want to find a balance compromise. We moved from remote to close (2 blocks) to train and bus hubs. I hate how much time must be spent for some of them and will use your post here to help influence our decisions. Appreciate this input and perspective. Excellent! It is great to hear an employer start to care about it from their perspective too. At one of my old jobs, I remember the company founders insisted on keeping the company in Boulder, CO during a relocation because they personally lived there, rather than moving East 10 miles where most of the employees lived because of housing costs. Personally I’d gladly move to a cheaper place to save 50 people from commuting, rather than making them commute to me because I was the boss and was the only one who could afford to live near the office. More than practical or rational options, people do many times a choice made on status, ego or social and professional afirmation and/or recognition. Automobile is to most americans like cows are to indians, they are sacred, untouchable and all public funds shall be put in, to promote costly high-ways and all the reltaed infrastructures. Despite what people by default do not consider: externalities. According to the Handbook on estimation of external costs in the transport sector made by the Delft University in the Netherlands and which is the main reference in European Union for assessing the external costs of automobiles, the main external costs of driving a car are congestion and scarcity costs, accident costs, air pollution costs, noise costs, climate change costs, costs for nature and landscape, costs for soil and water pollution and costs of energy dependency. In Europe just these costs are totally around 0,15€ per km, around $0,12 per mile. A odd connection I’ve noticed with people who live waaaaayy far away from work is this: they will always choose a vehicle that gets the worst possible mileage for commuting. I wonder why that is? Did all of you know that the majority of Americans now commute to work in gas guzzling trucks? I was reading about it in the Wall Street Journal and it is obvious to see just by sitting on a street corner and counting the types of vehicles going by. Even college graduates who took Physics 101 choose to commute in these gigantic vehicles which just proves that college was wasted on them. I live in Washington, DC, where I believe the concentration of college graduates is the highest in the land, and 70% of suburbanites drive a very large truck to work. It is pretty funny how badly people do the math, and your observation is definitely correct. If it’s any consolation, I found myself in a San-Francisco area rush hour recently and noted a distinctly different car mix than where I live in Colorado. About 5-10 times more hybrid and electric cars, double the incidence of reasonable-sized conventional cars, and 25-50% fewer farm and non-road vehicles (pickups and SUVs) being used for personal transport. But it was still all irrelevant since 90% of those people could have been biking to work if they made different choices. Then the next day I went for a ride with a local through the “rough” parts of SF to visit Lowes and grab some plumbing supplies. On bumpy pavement and with a bike that had a messed up chain and sprockets. It was great fun and we enjoyed passing the huge lineups of cars at every stoplight. Let’s go Californians! You have perfect weather and a some of the best bike lanes in the country. RYFBs. I commuted in SF Bay Area in a Toyota Seqouia SUV. I’d justify it because it was “safer” and I had better visibility. After finding your blog I have been reading it furiously. I just got my bike out last week and I’ve been riding it everywhere. I haven’t touched the car. It’s funny how often people offer me rides home from dinner, etc. I guess they need to feel like they get some use out of their minivans, pickup trucks and SUV’s. Love rereading your submissions! So I live 12 miles from work and wifey lives 7 miles in the opposite direction. Both cars are paid off high mileage types. (Camry 365K) So our cost with insurance would be in the 20 cents per mile. I’m not going to include the hourly rate as honestly I wouldn’t be working instead of commuting. I enjoy my commute on traffic free 4 lane Ozark roads! So mathematically, if we move to the big city of SPFD MO and are about 4 miles from work we should be able to afford a home 150 K more than our current home. I think the banker would have a laugh on this! The other thing is that that 150K more home would actually be way smaller and on a 1/4 acre city lot. There would be noise, crime, lots of people and all the city nonsense. In the interim, I think I will do the work from home deal for 3 days per week and thus cut my commuting costs in half. Thanks for the math on commuting! It all isn’t as black and white as it might seem, but it is good to know at least some of the math and attempt to make rational decisions. Cycling is very good for your health – especially an easy bit like 12 miles each way a few times a week. With your enthusiasm for cars, it is quite possible that you’re not currently in the best of shape (my apologies for the speculation as we’ve never met and I could be totally wrong). The point is, if you’ve ever wanted to be healthier, leaner, more energetic, etc., and find that is not happening in your current lifestyle, biking to work could be a huge boost. Also, city life (or life in a close-in suburb) is generally very happy for those who know how to do it. If you like the country, that’s fine too, but there is a reason cities cost more: people choose to live there. Plus, you could do better than a Camry by using a scooter or electric bike. Or an electric car or used Prius. Some options might cost a bit more, but the real win is in burning the lowest amount of gas, not spending the least amount of money. Yeah, no, I don’t remember when running became unhealthy. It’s still recommended by virtually every medical body, unless there are individually limiting factors (e.g., a preexisting knee injury). Exercise really is the fountain of youth. As a new mustachian, I recently sold my financed car and purchased a 12 year old $5k car with cash. I have been putting my would be car-payment to my mortgage payment. I also bike commute 80% of the time to work. I did live car-free for a while, but ultimately decided that even though I knew how much extra cash I had without a car, that the convenience of not having to rent or car share (zip car left our town) was worth the added cost. What I’m amazed by is that people think I’m ‘weird’ using my bike to commute and living close to work. Almost no one I meet ‘gets it.’ Personal finances aside, does anyone think about the ultimate environmental outcome of every adult human being owning a car and driving an hour every day? A good friend of mine works in said suburb and is getting married soon. Her fiance just graduated and took a job some 70-100 miles from where she lives and works. She told me last week that they were moving to a halfway point, 35 miles from both of their workplaces, just off the toll road, and that they easily expected to pay at least $200 in tolls per month plus gas, which she didn’t even want to think about. Also, they’d probably both need new cars by the end of the year since they were driving about 1400 miles a month each. 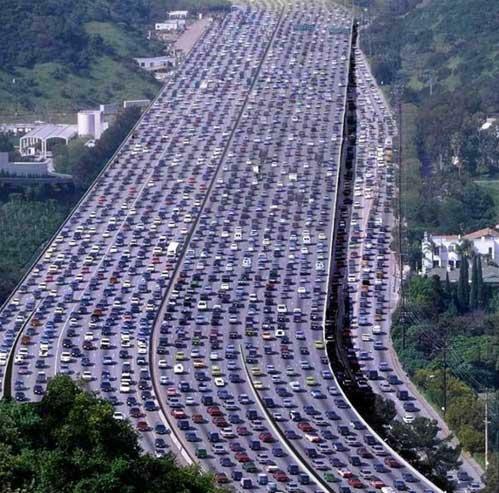 It just blows my mind that they’d sign up for this kind of (KILLER) commute and throw the money down the drain. They both have mechanical engineering degrees. I’m surprised that’s the closest job he could find..or maybe it just wasn’t a priority to have geographically close work locations? I didn’t ask, but she said “money won’t be the problem, it’s just the time”. So I didn’t press for the mathematical details. I’m guessing that they’re taking home about $130-140K together at entry-level jobs. I live about 15 miles away from just about everywhere, and I don’t have the money to move (I’m unemployed :( ). I’ve been thinking about selling my car and getting a (used) motorcycle. Would this be a good midpoint between driving and biking? This is the first article that I read about 8 months ago that brought me into Mustachianism. At the time I was commuting 30 Minutes into work and 1.5 Hours back home due to traffic. It was about 30 miles each way. For about 6 months I took public transit which made it 1.5 Hours each way but I could subtract at least the morning commute from work. I was miserable and had no time for anything else. Fast forward to now, I live 3 miles from the same job and bike to work in 12-15 minutes. It feels nice getting home at 5:15 after passing all the cars which are backed up in traffic and walking to my mailbox. Thanks Mr. Money Mustache for helping me take my life back. First of all, I love this blog and this is my first time commenting. Just wanted to say that I am starting a new job in July and can WALK to work. No more commuting, sitting in traffic on the highway, wondering if there will be accidents along the way. I can now be outside, get a little exercise and save on gas! Can you tell I am a little excited? Love this post. I live in Indianapolis, 12 miles from work. My husband is closer, but we needed housing to accommodate a kid and elderly person. I completely agree that commuting is an obscene waste of time and money. However, there comes a point where you’re exposing yourself and your children to more than just a bit of harmless “real-world diversity” as you so artfully put it, and paying that considerable cost might be well worth avoiding the potential consequences of evading it. It is in the 92nd percentile of all cities in America in terms of crime rate, with especially high violent crime numbers. The public schools reflect this, with all sorts of drug, violence and gang issues. But don’t take my word for it, look the place up. It makes New York City look like a paradise of safety. That isn’t the sort of “real-world diversity” that enriches the lives of your children, and sets them up to better cope with the wider world. This is the sort that gets them a subpar education that will leave them woefully ill-prepared for adulthood at best, and addicted to drugs or killed at worst. I suppose the lesson is to not take a job in a place like that to start with, but it was all I could get at the time. It almost hurts to think how much better off I could be financially if I had been able to implement your strategy, and I plan to do just that the minute I find a better position in a better place. After 6 months of searching for a job, I found one 16 miles away. It was between a 40-1 hour commute! Public trans would have taken double that and it was over a major bridge and up a high hill, so biking was out. I even had to pay for parking! Pay to park on gravel! I knew it was a pain, but I didn’t realize how expensive it was until I got a job close to home. I walk in the mornings and take the bus in the evening. I have SO much extra money to put in savings… hundreds of dollars each month. Plus I get home at a reasonable hour and am more excited about cooking rather than ordering out. I’m not a mustachian, but even keeping myself in a lifestyle that has me wearing new pants and a meal out once in a while, I couldn’t spend it all! A late reply to this article but timely all the same. When a potential move to another country came up for us early 2013 I promised myself that I would make the move something worth doing, which to me meant lifestyle changes that made sense of moving to the other side of the world. So out went the 2 hour each way commuting times and becoming a one car family. Since I started reading this blog last year I have been commuting to work by bike now for an entire 12 months, initially 15km each way but now only 10km each way with a new job. Its made a huge difference to my life and my husband cant stop telling people about his wife’s bike ride to work, he makes them all so envious! Thanks MMM for putting me on the road, literally, to health and hopefully more wealth. Couldn’t agree more! I live about 5 miles from work. In the summer I ride my bike and in the winter I walk (there is a deadly hill I have to go down every day that is simply too dangerous in the winter). Also, weirdly, pretty sure you grew up in exactly the place where I live now. Weird! Referring to not only this, but the “Moving to a better place” article too: there are cities (in Europe actually a plenty of the total) where public transport is an absolutely reasonable choice, completely natural for a huge part of the population. Almost 5 years ago my wife and I foolishly left our cheap and tiny house in the city (in Ontario, Canada) to move to a large log house on 160 acres of beautiful forest and hills. As nice a place as this was to live, this left me with a 35-40 minute (28 mile) commute (wife is a stay-at-home mother). While researching fuel-efficient vehicles about two years ago to replace a worn-out Honda Civic, I came across MMM and it changed our whole perspective on things. We have always been pretty frugal and somewhat badass I suppose, but did not realize how much it was costing us to live in this beautiful rural setting – even with Mustachian vehicles (Toyota Matrix and Honda Fit). I’m happy to say that we have now moved back to our old street that we left 5 years ago (in a different house though) and I now have a commute to the office that is about 90 seconds of downhill biking or 10 minutes of walking away. Our 4 year old son’s school is almost equally as close. I have reclaimed so much time, we are getting more exercise, and our cars are being used infrequently. Next step: sell one of the now totally redundant cars and gain some cash while reducing our auto-related expenses. Additionally, we have turned some friends on to Mustachianism and it is great to have some like-minded company as we become more Mustachian and Badass together in our little corner of the world. Thanks, MMM! Actually, according to my calculations, a bicycle is two times faster compared with the automobile, if you consider the virtual speed concept. People forget they need to work, and to work you need to allocate time to it, to afford their miles made by car. How about moving downtown so that a job is within walking distance but has a few $100 increase in rent? The only cost for me isn’t gas/insurance but public transit. My rule – never work any place that I can’t commute to for work. It has done me well for 28 years. My wife has a 20 min commute by car but has to carry too much “stuff” as a teacher and with late night meetings biking is a hassle. I had offers of jobs 20 miles away and just said no thanks. I bike all year so when I do have to take the car to a meeting or something I don’t feel too bad. I am about to take an incredible and high paying job as a technical instructor in Tyson’s Corner, a very expensive suburb of DC. I am also divorcing (another topic all together), and will only need to rent a 1br apartment for the next year or two. There are apartments within a mile from the office for about $1,600/mo. If I go out about 5 miles I can get something for $1,400/mo. If I take the metro across town (45min+) I can get an apartment for maybe $1,200. By using the $795/mile per year calculation, the apartment 5 miles away really adds ~$330/mo, and the metro option is even worse. The time I would have spent commuting I can work, and bill, overtime hours. The commuting cost savings plus just one hour a day of overtime (rather than commuting) will add up to over $12,000 a year (before taxes, of course)! Thanks to Mr. Money Mustache, I will be financially smarter and earn more by not commuting! I think this might add to the conversation. The Center for Neighborhood Technology (CNT) out of Chicago has assessed the true cost of house to add in the prices of house plus the price of commuting. It allows one to realize the true cost of a location and is easy to follow since it utilizes google maps. I hope this helps and this is entirely free. Your numbers on the extra mortgage are little high, as the banks require you to pay the entire mortgage not just the interest. But $795 / 12 = 66.25. Which will pay an $11,000 mortgage amortized over 25 years. So for every mile you save in driving you can increase your mortgage by $11,000 with no impact to your lifestyle. Except enjoying the extra time you have saved by not driving. This was incredibly useful and informative! My husband achieved the goal of finding his dream job about 3 months ago. He is a corporate executive chef for a craft beer gastropub. Unfortunately his office is 43 miles from our house. The restaurants he travels to numerous times a week are 59, 39, 42, and 73 miles away from our house. We have 3 children ages 2, 7, and 10 who simply don’t see him Monday through Friday anymore. I’ve been trying to weigh the options, as I worry about moving the kids from their friends….but housing is MUCH more affordable by his job, the schools are rated better, Gas is cheaper, and taxes are cheaper (we live in new england and it’s another state). Reading this makes it seem like a no brainer I guess. I can totally understand the hesitation about moving your family and kids. Remember though, kids are actually VERY resilient. We moved when I was 7-8 for my dad’s work, and I was upset at the time, but made new friends once I got into school and totally forgot the issue. I recently moved from a job only 2kms, 10 minute bike-ride from my house to one that paid more, about a 20-30 minute drive. Why would a dedicated MMM reader do such a thing? Everything has a price, every decision needs to be weighted. My new job at a community college pays better, comes with a full pension. I get a raise every year. It requires working a LOT less hours. It is flexible and I can work from home once or twice p/ week. I get 10+ weeks off per year, the ENTIRE summer. And… this may sound a bit crazy, but I kind of enjoy the 30 minute drive. It’s all highway, and I am going against traffic. It’s a bit of “me” time. Commuting is a consideration but it is not the only consideration in choosing your job. I am completely onboard with the general arguments about impact of commute on quality of life, and generally look at it in terms of opportunity cost, rather than financial costs. More specifically, you mention $625 in terms of time commuting. But there is an assumption here that you reclaim that time with productive work, correct? I believe you are positing it is an opportunity cost of time commuting versus doing other paid things. To wit, assuming you being paid hourly, you could have realized higher returns on your time if, and only if, you opted to do more paid work. Given that you covert this opportunity cost into a fiduciary loss, I think, is onerous to me. Or am I missing something in how you consider opportunity cost? Again, philosophically I agree with the true costs of commuting cannot be understated not just to your wallet, but to your time and environment. But I have a hard time saying you are losing $625 since this is the most you lost, assuming you had other paid work you could have done in that time. Again, there is nothing wrong in your logic if you apply that assumption, but for many people who will not capitalize on that gained time to do paid work, then your calculus does not apply. Let me know what you think. Maybe I am missing something in your calculation or logic. Or maybe I missed you calling out that assumption more explicitly elsewhere? In general, time is something you want to avoid wasting – you can either be producing, learning, or recharging in a positive way. Car commuting prevents or hampers most of these things for most of us, so I am just suggesting that you consider the time to be valuable by giving it at least $25 per hour of value. I hate commuting (possibly more than even MMM) but when I was forced to commute a rather long distance (40 minutes each way! ), I was able to use that time productively by catching up with family, learning Spanish, and listening to books on tape. I wouldn’t trade my current 8 minute commute, though! pollution, risk of injury, etc.but just no mega mansions for me. I always knew that wasn’t what I wanted and it’s nice to know there’s a whole world of others who agree with a lifestyle of less excess. I got a bike! It’s a mountain bike, so not perfect, but I got one! It’s apparently about 1.5 miles to the farmer’s market, according to MapMyRide, and it’s all hills. Going downhill is terrifying, and going uphill is exhausting, but I figure it will get easier with time. I have no car and use public transport to work. Living in Vienna, I am lucky as public transit is very good, reliable and safe. Yearly tickets are also heavily subsidized, so I save about two months’ worth of tickets every year. Many people I know do not want a car and only hire cars if they need to go to far flung places. In Europe we have relatively good public transports, almost omnipresent and reliable in urban areas. Nevertheless in countries with low population density, due to economic scale factors, public transports are not efficient for the mobility panorama. That’s why in countries like Australia, many people use car instead of public transports while in the Netherlands so many people use bicycle and public transports. Density has a major role to play on these mobility equations. I have no car. They’re a waste of money. For people in US car is sacred, it’s the country in the world with the biggest motorization rate! I really wish I could because I hate driving in South Florida but I have a very good housing situation and can’t the security of my job being worth it to trade in my great housing arrangement. I will have to drive the 26.3 miles roundtrip to work, but trust me I wish there were similar and closer jobs. Well…I’m coming in two years late on this one but here goes. I couldn’t agree with you more! If that couple ends up moving to your neighborhood…they will likely regret their choice to make that commute every day. Besides that, would they even have time to enjoy the neighborhood? I spent an entire school year commuting 45 minutes one way for a job. I hated the commute. I was constantly thinking about that 7 1/2 hours I wasted sitting in a car every week! Why did I do it? Several reasons. I’m a teacher and the job I took was temporary (a long term sub position for a maternity leave) and I needed to build up my experience to get a permanent position. The job wasn’t going to last forever. I also had 2 kids in high school-NOT going to uproot them and make them go to a new school in 9th and 11th grades. But the best biggest reason for not moving is that my husband worked and still works just 2 blocks from our house. He always walks or bikes to work…no matter what the weather is. So jealous of him! This year is much better. I have a 25 minute commute and I’m much happier. 25 minutes is still too long according to you, but I LOVE my position. I’m actually happy to go to work each day because I love what I do,…besides that, hubby is still walking and biking so we’re doing okay. I know this post is old, but as a Montrealer, I fail to see how I could bike through the winter in feet of snow. Besides my job is far enough that public transit is the way to go for me, I who have only ever driven a few times in a half-hearted attempt to get my license, which I never ended up doing because the idea of driving is kind of disgusting to me. I intuitively figured out the car-clown thing and am now seeing that I’m not just a cheap Luddite, I’m just smart and your blog is helping me to start seeing ways that I could improve my life. I LOATHE working and am convinced I could be retired by 40 (12 years from now). Thanks for the blog !! All very true. There’s also the culture of ‘presentee-ism’ in many workplaces. Lots of us could work from home 2-3 days a week, but despite all the advances in technology, so many of us in white collar jobs (where our work outputs mainly are virtual documents and e-mails and calls) drive miles from one PC connection point in our home office to another PC connection point in a rented office miles away. As if customers or colleagues cared a rap about where you are sitting when you send an e-mail. Collective lunacy. I consider my self very smart with money and frugal. I am a 26 yr old finish/trim carpenter, I made $50,000 last year. I am working on getting my license to increase that pay. I live in the SF Bay Area. I live with my parents to save all that I can, as average rent in my area for one bedroom is $2200. My work truck is a 1999 2wd manual transmission diesel F350 that averages 18mpg(wich is good considering the gas equivelant truck gets 10-12 mpg. Yes I know the difference in fuel about evens out but sometimes I need to tow for work and I paid $6000 for the truck. My current job is 21 miles away and on a good day 40 mins and on a bad day 70 mins one way. I love the job hate the commute. I can’t move or live much closer as where I work is near Google, Facebook , all the tech giants.. Homes are 1-20$ million and condos are 500k or more. Or you can live in east Palo Alto where it’s a little cheaper but one of the highest crime rates in the state, or country. My commute cost in fuel right now is about $50 a week, used to be more with higher diesel prices. So my question is, is there any room for improvement? Public transit is not an option because most days I need all my tools, and there is no transit to this area. I can opt for a little cheaper truck, but for work trucks I can’t do much better and wouldn’t save much. I hoping when I get my contractors license I can choose jobs closer to where I live. But right now I am kinda stuck with this commute as this is where all the money is, and residential construction still hasn’t fully recovered from the economy it seems. My ultimate goal is to work and save here for 5 ish years, me and my girlfriend will be married, have money, and be able to move to an area where we can afford a house and work close to home, but currently I feel stuck. I’m a new reader, loving all the posts I’ve read so far. But I’m struggling with some math in this one. It seems to me you are considering 250 work days /year, right? To get this, I’ve divided those 25 hours /year of commuting per mile, by the 6 minutes mile drive. Also, I’m not getting when you say that the mile round-trip multiplies to 500 per year. It seems to me that the mile multiplies to 500, but the mile round-trip multiplies to 250. If so, the computed value would be half of what was said. Am I getting the math wrong? What is my mistake? “$795 per year will pay the interest on $15,900 of house borrowed at a 5% interest rate. Well, 795 is only the interest. But one would still have to pay the principal. Does it justifies buying a house closer to work? Because if instead you invest that money you would spend buying the house, you could be much better within 10 years, no? I think another, and easily overlooked, cost of commuting, may be vacations. Having lived as both a medium distance commuter in a more suburban setting and as a car-optional bike/car commuter in more urban neighborhoods with many public, cultural, and natural amenities, I found that in the suburban setting I have a much, much greater desire/propensity to spend money taking expensive vacation trips. Versus just absorbing and enjoying the place I live. There may be no cost difference, but day to day the stress level in the urban setting is a lot lower due to all the outlets. I’ve sent you some questions a while ago and didn’t receive any reply so far… Could you check please if you may have missed it? I went to college for four years. I live in the Midwest, am fairly happy with my area, and all of my family and friends are proximal. I graduated college at the cusp of the recession, and jobs in my fields evaporated quickly. I started as a PHP coder making $13/hr, eventually promoting to senior developer at $15/hr. The company then went under and everyone was let go. In short, I’ve been commuting to this job for 3 years now. Jobs this good just don’t exist closer. No one else I work with lives near me, so carpooling isn’t an option. I haven’t received a COL or merit raise once in these 3 years. Ignoring returning to freelancing just for now, should I just take a lower paying job closer to home? Should I move into the city and accept $1200/month rent for a tiny studio? Or should I do a skydive and switch career fields altogether and pursue my latent interest in healthcare (may require a 2-year degree)? Have you considered telecommuting? Telecommuting doesn’t have to mean freelancing; plenty of companies are open to hiring good developers to work remotely on a permanent basis. I certainly would not consider switching fields if you have a passion for coding. As Ian Turner suggested, telecommuting is a great option. If you want to stay at your current job, have you considered rooming with someone in one of the more affordable, safer areas closer to work? I am not sure where you live, but I would have to think there is an area 15 to 20 minutes away from your work that is safe and affordable. I live in metro Detroit, and that statement is certainly true here. I had roommates for several years post college. It helped me build my savings, build up a down payment for a house, and helped to pay my mortgage after I bought my first house.